This is the must-read book for designers who want to expand their skills and improve the quality of their designs. Learning CSS technology and continually improving one’s design and developer skills is essential for every Web designer in today’s marketplace. 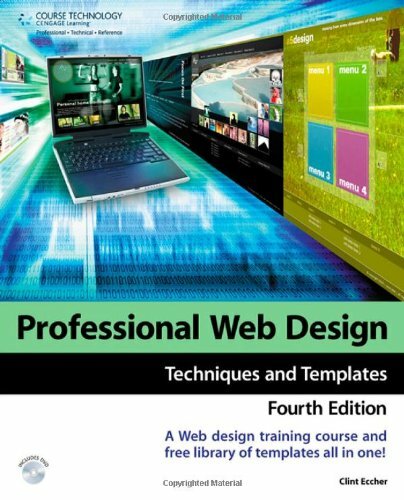 The goal of Professional Web Design: Techniques and Templates is to educate beginning-to-intermediate Web designers on the various issues involved with Web design through general discussion, case studies, and specific tips and techniques. Using easy-to-understand language and concepts, the book teaches designers and developers how to create professional-quality CSS-based designs. Search Engine Optimization (SEO) is explored, giving the reader a strong, basic understanding of how to get sites to rank better in search engines. Conversion Rate Optimization (CRO) also is explained, helping the designer create a more efficient site for the users who are already visiting. You’ll get the benefit of the author’s experience. With more than 15 years of experience as a Web designer for Fortune 500 companies, non-profits, and small businesses alike, Eccher has learned numerous tips and techniques of the trade and discloses them here, saving you time and aggravation by alerting you to potential pitfalls.